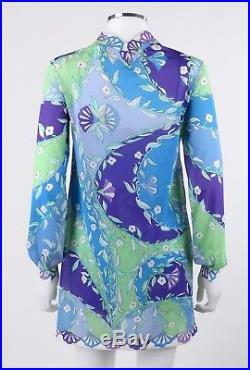 Vintage Emilio Pucci for Formfit Rogers c. 1960's two piece blue floral print shirt and slip dress set. 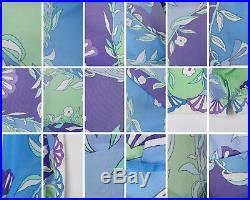 Multi-color signature floral color blocked print knit in shades of blue, green, purple, and white. Seven center front covered buttons with single snap closure at top. Long sleeves with gathered detail and single button closure at cuff. Two front angled bust darts. "Saks Fifth Avenue" tag at interior of both pieces. 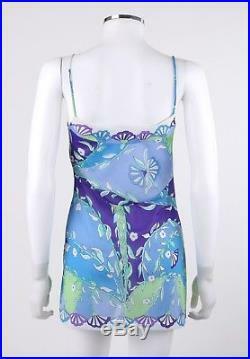 Marked Size: Tunic Dress: "P / 8 - 10"; Slip Dress: "32 / 10 - 12" (Vintage). Shoulder: 15.5 (seam to seam). Sleeve: 23 (shoulder seam to cuff). Chest: 34 (armpit to armpit; unstretched). Waist: 34.5 (measured 6 below chest; unstretched). Hip: 37 (measured 6 below waist; unstretched). Total Length: 28.25 (center back to hem; excluding collar). Chest: 28.5 (armpit to armpit; unstretched). Waist: 26.5 (narrowest point; unstretched). Hip: 31 (measured 6 below waist; unstretched). 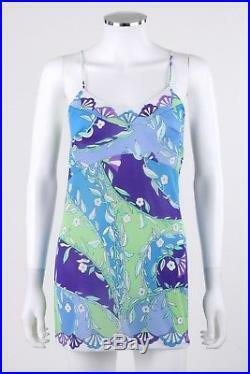 Total Length: 29 (top of strap to hem; measured on back). Excellent / Wear consistent with age and use. Aside from minimal imperfections including few minor pulls/runs; single button missing at right cuff; one small pin prick sized hole as showcased in photos. Please refer to all photos as they are a part of the description and condition report. Contact information for our retail store can be found through eBays Ask a question option under the Pay for item section. We will not mark any parcels as gift or falsify costs or contents. All of our terms and pricing are in place for a reason and are not negotiable. We do our best to properly and accurately describe each and every item, but there are variations in how people view, interpret and notice condition, alterations, measurements, etc. On some items it is near impossible to mention every imperfection and for this reason our listings include multiple photos of each angle of our items for sale. The pictures are part of the description and condition report. Color may appear differently on varying monitors and device settings. We do not clean or treat any of our garments. We are careful and selective of the items we sell according to their condition / cleanliness. Everything in this world has a scent, which varies by age, storage and prior use. 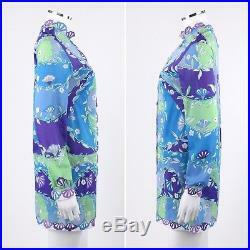 Unless otherwise stated our items are not new or factory direct. 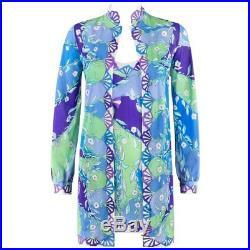 We sell only authentic items and authenticate every item prior to it being listed. Thank you for your trust! 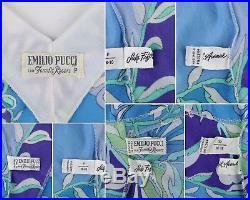 The item "EMILIO PUCCI Formfit Rogers c.
1960's 2 Pc Blue Floral Print Shirt Slip Dress Set" is in sale since Friday, August 10, 2018. 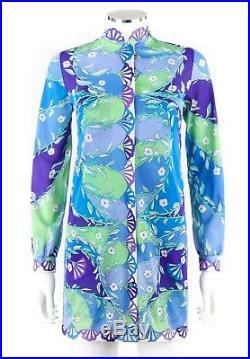 This item is in the category "Clothing, Shoes & Accessories\Vintage\Women's Vintage Clothing\Sleepwear & Robes".resale" and is located in E-COLLECTIQUE. This item can be shipped worldwide.